Spence Legal Services has moved! Spence Legal Services has moved to a new location in Minnetonka. Cindi continues to provide representation to individuals and families throughout Minnesota in the area of guardianships and conservatorships. 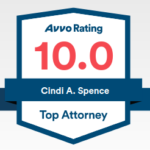 If you or your loved one need information on establishing a guardianship or conservatorship for a vulnerable adult, a “child” turning 18 or a minor who is the recipient of an inheritance or settlement, please reach out to Cindi to discuss your situation.